1:1 From: Paul, an apostle1 of Christ Jesus, chosen by God to reveal his promise of life that’s available through Jesus the Messiah. 1:2 To: Timothy, the son I dearly love. May God the Father and Christ Jesus our leader2 show you their great kindness3 and mercy. And may they give you peace. 1:3 I never stop thanking God for you. I’m also praying for you day and night as I serve God with a clear conscience, like my ancestors did. 1:4 I remember how you cried. I really want to see you again. It will make me happy. 1:5 I also remember your faith. It was authentic—just like the faith of your grandmother Lois and your mother Eunice. I’m sure your faith is as genuine as ever. 1:6 When God gave you his gift that day I placed my hands on you,4 he lit a fire inside of you. So, go ahead and fan the flames. Light it up. 1:7 God put his Spirit in us. This isn’t a spirit of fear, to make us timid and cowering. It’s a spirit of power, to make us loving and self-controlled masters of our own behavior. 1:9 God saved us. He called us away from a life of sin and he invited us into a life of goodness and devotion. He didn’t do it because we were wonderful people who did lots of good deeds. He did it because that was his plan all along, to express his kindness to us by sending Jesus the Messiah. 1:10 God’s plan isn’t secret anymore. Our Savior, Jesus the Messiah, set the plan in motion when he came. He destroyed death.6 And gave us the Good News of everlasting life. 1:12 I’m suffering because I did what I was appointed to do. I’m not ashamed. I know who I believe. I know that he is able to guard this life I have entrusted to him until that day8 when I see him face to face. 1:13 Keep spreading the same message you heard from me, which I delivered in faith and love from the Messiah Jesus. 1:14 Guard that message like a treasure entrusted to you. The Holy Spirit lives in you. He’ll help you do that. 1:15 You know that all my associates from your region of Asia9 have deserted me—even Phygelus and Hermogenes. 1:16 I hope the Lord shows special kindness to Onesiphorus and his family. He cheered me up when I was feeling down; it was invigorating. He wasn’t ashamed of being seen with me, a prisoner in chains. 1:17 When he got to Rome, he searched high and low for me, and he found me. 1:18 May the Lord treat him kindly on that day10 when we stand before our God. You know what a great help he was there in Ephesus. More literally, “Christ Jesus our Lord.” This works today like a divine title. But in the early days of the church, “lord” referred to a boss, a master, or a person of high status or respect. “Christ” was the Greek version of “Messiah,” which in Hebrew meant “Anointed One,” as in a king anointed under God’s authority. A literal translation today might be, “Messiah Jesus our leader.” But early on, Christians started using “Christ” as more than the Greek word for “Messiah.” They used it as part of Jesus’ name. Paul may be doing that here. “Laying on of hands” was part of a ritual to appoint people as church leaders, as it still is in many churches today. Other church leaders would rest their hands on the shoulders, backs, and heads of candidates for appointment, and pray for them. Jesus defeated death by rising from the dead. That convinced his followers that death didn’t win. Eternal life wins. Some ancient copies of this letter add “to the non-Jews.” Paul was most effective when he talked about Jesus to people who weren’t Jews. When he talked with Jews about Jesus, he often got run out of town, put in jail, or stoned (see Acts 13-14). The letter simply says “until that day,” without adding the implied reference to the Second Coming of Jesus and Judgment Day. In Roman times Asia did not refer to the Far East. It was the territory on what is now Turkey’s west coast. It was home to one of the largest cities in the Roman Empire: Ephesus, where Timothy ministered as a pastor. 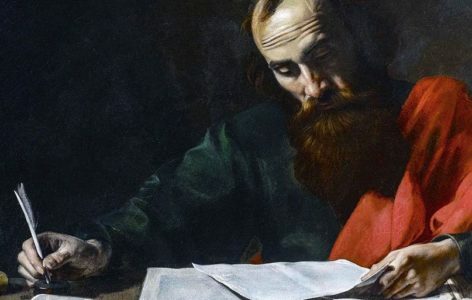 In all of Paul’s writings, this letter to Timothy is often considered the most personal and most intimate. At times, it might feel a bit embarrassing to read—as though we’ve opened someone else’s letter. Bible experts can only guess about it, but what would you guess Paul might be talking about when he says, “I remember how you cried” (1:4)? Paul reminds Timothy, “When God gave you his gift that day I placed my hands on you, he lit a fire inside of you. So, go ahead and fan the flames. Light it up” (1:6). What gift? Some scholars say it’s the gift of evangelism, “the work of telling the Good News” (2 Timothy 4:5 NCV). If we wanted to make a case that Paul was talking about the gift of receiving the Holy Spirit, what evidence do you think we might use? Paul tells Timothy not to be ashamed of him as he suffers in prison. Then he says something that doesn’t sound like the kind of thing one friend would tell another: “Pick up your share of the suffering we have to endure if we want to spread the Good News” (1:8). What kind of suffering do you think Paul had in mind? And what kind of suffering do you think Christians in your own circles of life have to experience because they are Christian? LIFE APPLICATION. Paul reminded Timothy that “God put his Spirit in us” (1:7). If God’s Spirit lives in each one of us, how do you think it affects us? And what difference is there in our conscience talking to us and the Spirit talking to us? LIFE APPLICATION. Perhaps most people in Paul’s day looked down on people in the new Christian movement. And many certainly looked down on Paul, chained up in prison and possibly awaiting execution. Yet Paul tells Timothy, “Don’t be ashamed of speaking out for our Lord. And don’t be ashamed of me” (1:8). When do people experience shame today when they don’t deserve it? LIFE APPLICATION. Chained in prison, Paul was deeply troubled by the fact that many of his colleagues deserted him (1:15). Probably most of us have felt abandoned a time or two in our life. What do you think are some of the emotions Paul experienced when he realized many of his associates had deserted him?